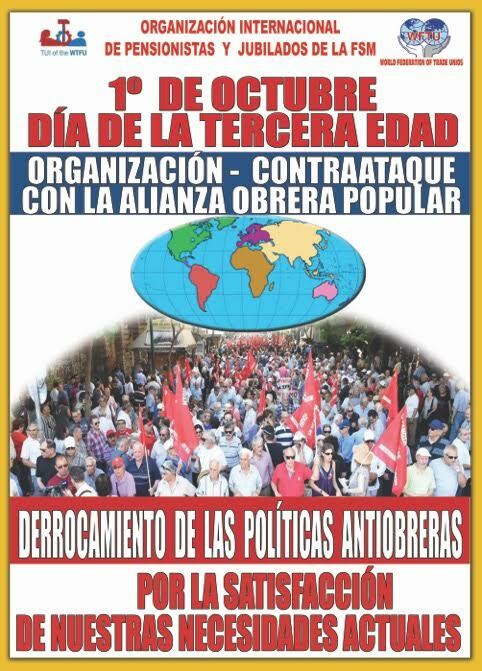 I am giving below the call of TUI (P and R), WFTU, for organising October 2017 as Pensioners International Day. Capitalism is pushing new anti workers working class action against pensioners, and people. Solutions using government-administrators are temporary and weak, with no prospect or positive outlet for those whose work produce wealth in society and only give benefit to a handful of capitalists who gather in huge measure, the fruits of exploitation. The measures taken by the leaders of capitalist development, with competition among capitalists as a motor, require new sacrifices from the working class, pensioners and the people, increased exploitation, and to end all rights remain. Greater limitation and abolition of public social security for the benefit of private, cancellation of collective agreements and extra payments to pensioners; plus a further reduction in costs for health, medicine, and social benefits. All this complemented with new concessions to big capital through privatization of major sectors of the economy, energy, transport, water, natural resources, and new tax exemptions. On behalf of capitalist competitiveness, pensioners and retirees worldwide worsening live your life and the lives of their children. Their pensions are cut, reduce health benefits and privatize, social structures dissolve, their rights are restricted in general. To achieve these objectives own capital does not hesitate to resort to bloody conflicts and wars around the world, which violently appropriates wealth of many people on the planet. We call to action, all our organizations and partner organizations, for next October 1, International Day of pensioners, with claims that correspond to our real needs, from the perspective of our struggle a society without exploitation, poverty, wars or calamities. Struggles do with unity and common action with the working class, the people and all those who suffer from capitalist exploitation. We fought that way: For a free, public social security, health care and pharmaceutical care for all, without conditions or requirements. Let’s claim the right to public and adequate pension, reducing the age limits for men and for women earlier. Pensions that meet our current needs, so we can live a dignified life. For social benefits, housing, clean and right to leisure, public, free and quality water. WE ARE NOT AGREE WITH THE CRUMBS BURSTING capitalist barbarity. STRUGGLE FOR LIFE AND CONQUER THE FUTURE IN A SOCIETY WITHOUT EXPLOITATION IN BASE TO RICHES TO PRODUCE. LONG LIVE THE DAY OF STRUGGLE OCTOBER 1!